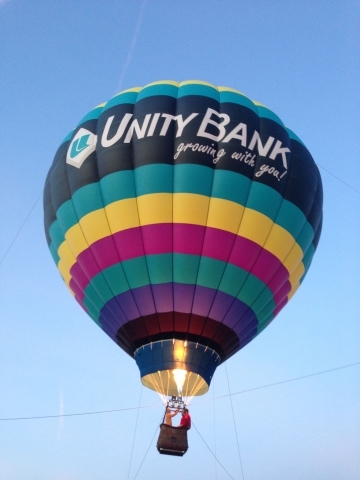 HARMONY TOWNSHIP, N.J. (July 25, 2018) - Unity Bank has donated its balloon to offer tethered balloon rides at the 81st Annual Warren County Farmers' Fair to be held July 28 - August 4 in Harmony Township. Donations for the tethered balloon rides will benefit the Fred Grotenhuis Drone Pilot Scholarship Program for students seeking Remote Pilot Certification from the Federal Aviation Administration (FAA) to operate drone vehicles commercially. Unity Bank is a sponsor of the Warren County Farmers' Fair, which features a hot air balloon festival that was started by Giulia and Fred Grotenhuis in 2001. Fred Grotenhuis, a lifelong Harmony resident, was a decorated U.S. Army helicopter pilot in the Vietnam War and an avid aviator with interests in hot air ballooning and drone piloting. "We are thankful for Unity's support for the scholarship because FAA certification is required for those piloting drones for commercial purposes," said Giulia Grotenhuis. "The scholarship is a great tribute to Fred. Interest in the certification program is likely to grow with Warren County Community College expected to offer certification training this fall." RE/MAX also donates a hot air balloon for one night at the fair. The proceeds of the bicycle balloon race are also dedicated to the scholarship fund. The Harmony event started as a gathering of farmers, mechanics and manufacturers in 1859 and formally became the Warren County Farmers' Fair in 1937. More recently, the fair mushroomed into an annual event with a wide range of festivities, including hot air balloon rides, carnival midway games and rides, traditional craftsmen at work, Mud Bog competition, and a tractor pull. The fairgrounds are located at the intersection of County Road 519 and Strykers Road in Harmony, about 3 miles north of Phillipsburg. For more information on the Warren County Farmers Fair, please visit www.warrencountyfarmersfair.org and for more information on the drone scholarship program, please visit www.fredgscholarships.org.